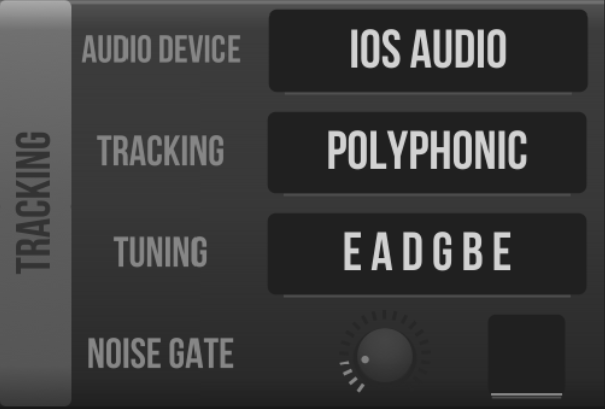 The MIDI Guitar App turns any guitar into truly polyphonic MIDI guitar. It is based upon JamOrigin’s groundbreaking polyphonic pitch detection technology. Please start reading below. If you still have problems we are ready to help in the new MIDI Guitar user forum. Please see the short video below. In order to connect a guitar to an iPhone or iPad, you need an audio interface that plugs into the lightning port or headphone jack. MIDI Guitar will work with any iOS compatible interface, but for best results use a lightning connector audio interface with a high impedance guitar connector and input gain control. MIDI Guitar will use the default iOS audio interface, which is generally the most recent audio interface you have plugged in to your lightning port or headphone jack. Go to the audio device (the very first selector that says “iOS Audio”). Make sure you have selected the input channel that your guitar is connected to. Also, check your input gain using the meter here. This is about music, so make sure you can use your guitar’s full dynamic range. Troubleshooting: If you still have no signal, you probably haven’t granted MIDI Guitar access to use the micropone (ie. you guitar interface). Go to the iOS settings app => privacy => microphone => make sure MIDI Guitar is enabled. The first steps is to play with the built-in patches. Many patches are quite like other amp-simulation software, but you should soon get a feeling that MIDI Guitar is also unlike anything else – it actually knows what you play and use it to trigger synths in various ways. Make sure you are in tune (use the Poly Tuner patch). 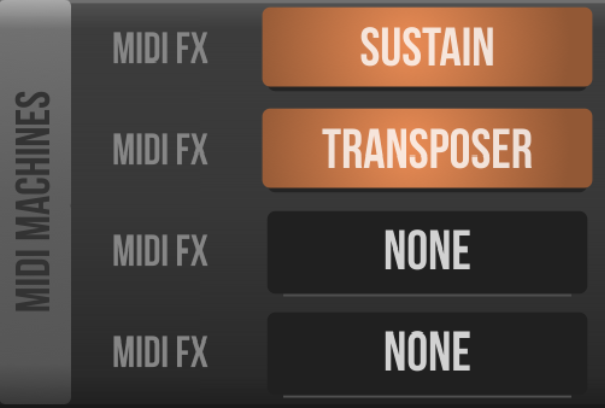 At some point you’ll want to try to send MIDI externally. Start with Garageband. Select the External MIDI Output patch in MIDI Guitar and verify the MIDI Output module is set to “Virtual MIDI”. Now open Garageband and open a synth inside Garageband. Your guitar is auto-magically connected just like a MIDI keyboard! For most people, MIDI Guitar “just works”. Unlike most hardware systems, you only have one parameter to adjust the tracking – a noise gate. You should generally leave the noise gate at its desault around one third, assuming that your guitar input signal use the full dynamic range (some cheap interfaces don”t). MIDI Guitar is tuned to be super responsive when you keep the noise gate low. That means, MIDI Guitar will rarely miss a note, even in the fastest legato runs. Most people like this responsiveness and that it helps to “connect” to the guitar and have a better play-feel. The flip side of very high responsiveness, is that it will sometimes produce spurious notes (very short, usually low velocity notes) at note onsets or offsets. The noise gate can remove the spurious notes, but at the cost of responsiveness. You should also stay in tune for best tracking quality. Use the built-in polyphonic tuner. The most compelling way to use MIDI Guitar is to let it drive another iOS synth or a DAW like GarageBand. 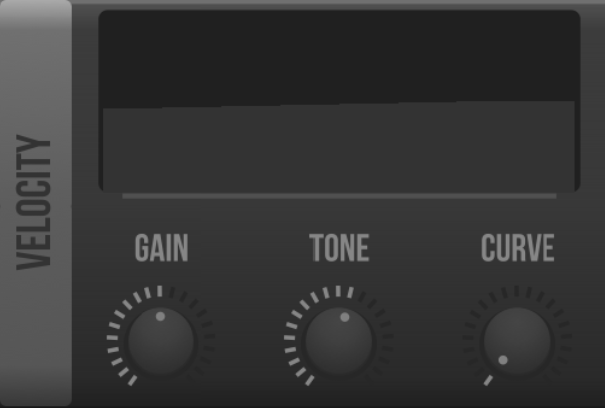 This way, MIDI Guitar output MIDI via Apple’s Virtual MIDI standard to any synth or DAW app. Many synth apps will appear as MIDI devices, and as an alternative to the above, you can select any such device inside the MIDI Output module. This can be more convenient because MIDI Guitar will save the name of the MIDI device in a patch, and thus you can create patches which outputs MIDI the your favorite synths. This approach requires a MIDI interface such as Apples Camera Connection Kit, iRig MIDI or Alesis IO Dock. The Apples Camera Connection Kit is quite undocumented for its MIDI capabilities. Google ‘MIDI camera connection kit’ for more info. Although not recommended, its possible to play wirelessly over WIFI networks. Due to the transmissioon of WIFI signals, it will have more latency than the what can be achieved with Virtual MIDI or a cable based MIDI setup. Mac have built in WIFI MIDI support. Please see the guide for Mac. Windows support for WIFI MIDI is relatively easy to setup with 3rd party applications. Please see the guide for Windows. MIDI Guitar’s pitch tracking adds very little latency. But if you use WIFI-MIDI stream MIDI via WIFI some latency will be added, due to the router and nature of wireless networks. Some users will feel that WIFI-MIDI are too slow for real playability, but it seems the amount of latency is dependent on the WIFI router network. Several users have reported decent WIFI-MIDI when using a network cable from router to computer. A good modern router seems to be helping too. The MIDI Guitar interface is divided into different sections, documented on this manual page. Also: feel free to visit our forum, if you have any comments or questions! On top of the screen, center, the current loaded patch is displayed. A vertical VU top right displays the CPU load, clicking on it will bring up a big fullscreen CPU load indicator, in which the tracking and every loaded instrument and effect will show its individual CPU load. Clicking the screen once, makes it dissapear again. This brings you to the shop for IAP (In App Purchase). 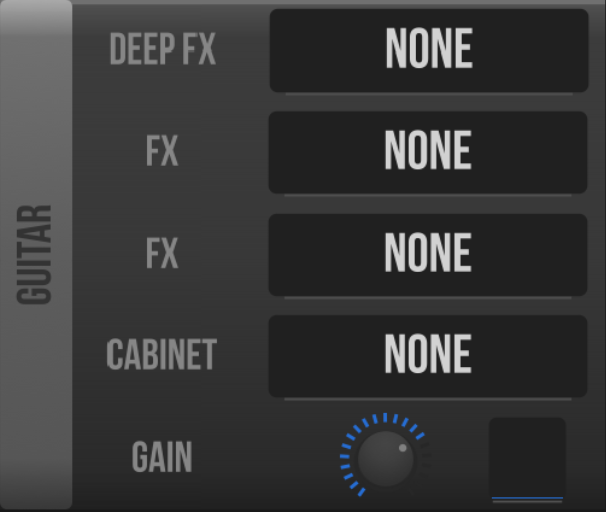 There first IAP is “guitar rig” which provides unlimited use of a the builtin set of fx and instruments. 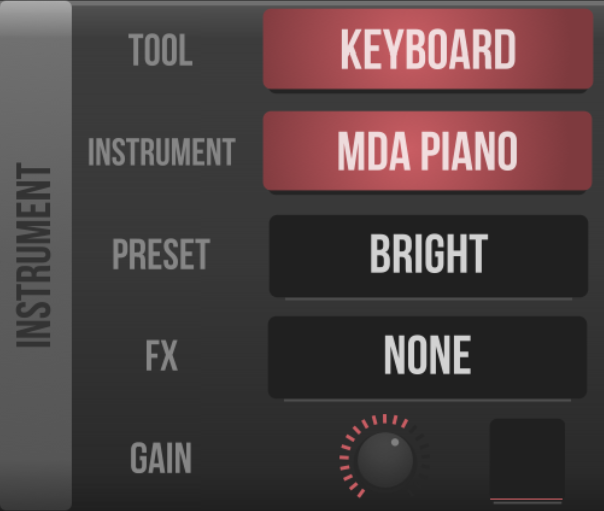 The second IAP is “midi output”, which enables unlimited use of the midi output. Clicking on the patchname will bring up a chooser for loading other patches. When the list is shown, clicking the background makes the chooser vanish. Clicking this will bring you to the audio interface chooser. MIDI Guitar always works with mono input and stereo output. Set tracking type. Polyphonic is default. Monophonic is a bit faster, especially in the bass range, and might be better for driving monophonic (analog) synths. Set this to the actual tuning of your guitar for best conversion quality. Currently D2 ( drop D) is the lowest note available in polyphonic mode. Monophonic mode is allways down to C2 (drop C), independent from this setting. The noise gate sets the level required for the softest note to trigger. If string handling results in spurious notes, set the gate a bit higher. About one third (10 o’clock) is a normal setting. A higher setting can be used creatively e.g. to have synth stabs on louder plucks. You can choose here whether bends are tracked and which range is used for sending them. The synth attached needs to have its range set accordingly. The bends are only send when one note is being played at a time, this to avoid false notes with single channel MIDI. Add artificial sustain to each note until the next note appears. when notes are connected this way, many synths create smooth legato transitions, mostly when they are set to monophonic. Adds midi aftertouch (polyphonic pressure) to each note. 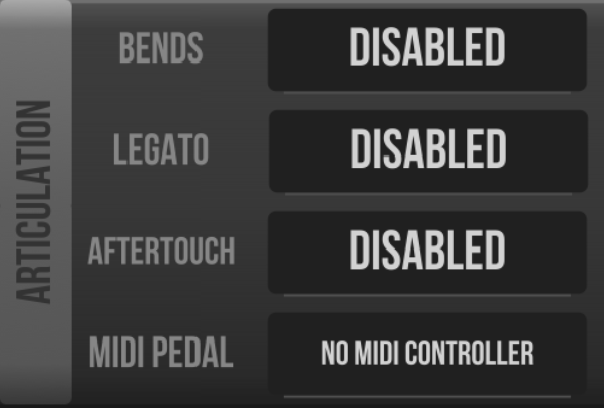 Selects the midi port for footcontrollers or other midi controllers. -If your pedal generates PC (Program Changes).. The patches need to be named with leading numbers, so that MG can load the right one. 003 My fthird patch name ( loads on PC 3 ). Beware: the current system works with a simple alphabetical sort, e.g. having two 003.. patches will put patch 004 at position 5.. Hide the unneeded patch by calling it “NOT003..” or simular, to keep the order. -If your pedal generates CC (Continuous Controllers).. Apply midi velocity gain to all notes, it is simular to your guitars volume knob, but in the midi domain. Apply midi velocity gain to high or low notes, it is simular to your guitar’s tone knob. Velocity dynamics. use velocity gain first! A hard curve will make soft curves harder. A soft curve will make hard notes softer. The mid position is neutral. is used with a midicontroller connected. -the CC must be set to the same value as your pedal sends. –there are 2 modes of operation. as long as the pedal is pressed, all notes reverberate. You can use this to have piano like performances. The notes sounding at the moment your pedal is pressed continue as long as the pedal is pressed, but no new midi notes are fed to the instrument. You can use this to underlay your guitar with synth chords. can be used with or without midi controller pedal connected. set transposition with the transpose knobs. activated the moment the pedal is pressed. The repeat function will repeat a sounding note transposed when the pedal is pressed. The [ CC ] must be set to the same value as your pedal sends. The transposition is activated the moment a note is higher as the treshold value. It will allow you to adress a midi port: this might a global used one like “virtual midi”, to which all running synths will listen or a specifically addressed synth MIDI input port. NEW: This option is now saved per patch! here you can select the polyphonic tuner, a keyboard or chord wheel visualisation. Select a builtin instrument to use. MDA Piano, MDA Epiano, JX10 AM synth and DX10 FM synth are available. Apply an impulse response to emulate a speaker/cabinet. The mix of instrument and guitar. Hard right for instrument, hard left for guitar only. Clickin on the [ MIX ] title will toggle it to [ SPLIT ]. In split mode the synth and guitar channel both get one mono channel: this is convenient when you want to amplify both signals on separate amps on stage. Caution: The FX loaded here is applied to both signals, so it has to be a stereo effect to not destroy the split separation! Sets the output volume for the mix or split channels.